This time I’ll compare two Bluetooth speakers from Bose. They are designed for slightly different environments. The first device is Soundlink Color 2. It’s more rugged and great to be used outside in rough conditions. The second one is Soundlink Mini 2 with great sound capabilities, but not as sturdy as its competitor. This review will compare these two speakers in the following categories: build and sound quality, connectivity and battery life. It weighs just over a pound, making it a good speaker for those who want to take their music with them on a trip. At first, the speaker looks similar to its older brother Soundlink Color, but after a closer look, you will notice a few changes in design. Now, the speaker has been redesigned and the hard plastic has been changed to the soft smooth rubber, offering a better seal and making it more resistant to scratches and bumps. In order to achieve the sleeker look, they’ve removed the rubber bumper and added rounded edges. On the front of the speaker, there is the Bose logo and the grille from which the sound comes out. There is also a grille on the back of the device that is responsible for bass frequencies. The micro-USB and 3.5 mm AUX port are located on the side of the device. The speaker is IPX-4 certified and can withstand a bit of water, but don’t try to throw it into a pool – it’s not waterproof. The disadvantage of the rubber casing is that it’s now a dust and dirt magnet, but thanks to its water resistance, you can use a wet cloth and clean it up without a problem. Similarly to Color 2, the Mini 2 hasn’t changed that much since the previous model. It’s still a combination of a good look and great sound. It’s not as sturdy as Color 2 and definitely not water resistant. You can take it outside, but not when it rains. It comes in two colors: black and pearl. This is a change when we compare it to the previous model which offered only one version that was a mix of these colors. The aluminum case of Mini 2 has its pros and cons. It definitely adds to the premium design, but I don’t think it will look great after getting a few scratches. If you want to keep your device in a good condition, you can buy a cover sold separately. Both devices have similar buttons, but Color 2 has one button more – the AUX button. In Mini 2, Bose resigned from this feature in favor of the automatic switching to the AUX input when the device is plugged in. It helps keep the speaker less cluttered. Similarly to Color 2, on Mini 2 offers a 3.5 mm jack. The sound of the Color 2 is similar to its predecessor, which is not a bad thing. Thanks to the positioning of the drivers and two bass radiators which are located on the back of the speaker, you can feel that the sound is coming from all around you, and not from one direction. But don’t expect too much from such small form factor. It can fill a small room with music, but you won’t be able to power a dance party. When it comes to mids and highs, they stay crisp and clear. The thing that I’ve noticed is that there was bit of problem when there are lots of instruments playing at the same time. The next new feature introduced to the speaker is the built-in microphone that you can use to answer calls and use Siri or Google Assistant. What is great about this speaker is that it produces a much bigger sound than it looks. It has powerful drivers and similarly to Color 2 passive radiators to give better bass than this tiny form factor would suggest. You probably won’t find a better bass in the speaker this size. Mini 2 performed well at any volume levels. I didn’t notice any distortions. 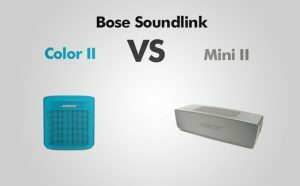 Similarly to the second edition of Soundlink Color, in Soundlink Mini Bose added a microphone to make phone calls or use a voice assistant. Overall it’s a good speaker, very similar to its predecessor, with a few minor tweaks that make it even better than before. Both devices offer an interesting feature, called a multipoint technology. It allows you to connect up to eight devices, without the need to jump through menus to switch devices. You can connect up to 8 units. You can download the Bose connect app for free which is available on both Android and iPhone. The app allows you to control such things as voice prompts, control playback and volume, and manage speaker connections. The app is not required to use the speaker, but it can be helpful. Color 2 offers the NFC feature. This technology is available only for Android users and allows you to tap two devices and connect them almost instantaneously. Bose says that the battery lasts about 8 hours, depending on the volume level you use. But in reality, it can last more than 10 hours. To save the battery, the speaker turns itself off after 20 minutes of inactivity. You can change this number or disable this function completely in the app. Mini 2 offers two methods to charge the battery – the first one, with the standard micro-USB connector and the second one with the special plastic dock, charging the speaker through the special metal pins that can be found on the device and the cradle. The first way of charging is better if you take your speaker on a trip and don’t want to carry the extra weight. The cradle, on the other hand, is great for home use. PROS: NFC feature / Water-resistant / Good sound. PROS: Cradle / Multi-function button / No distortions at any level / Small / Great sound. CONS: Dust and dirt magnet. CONS: Can’t be used with other speakers in sync / No NFC.